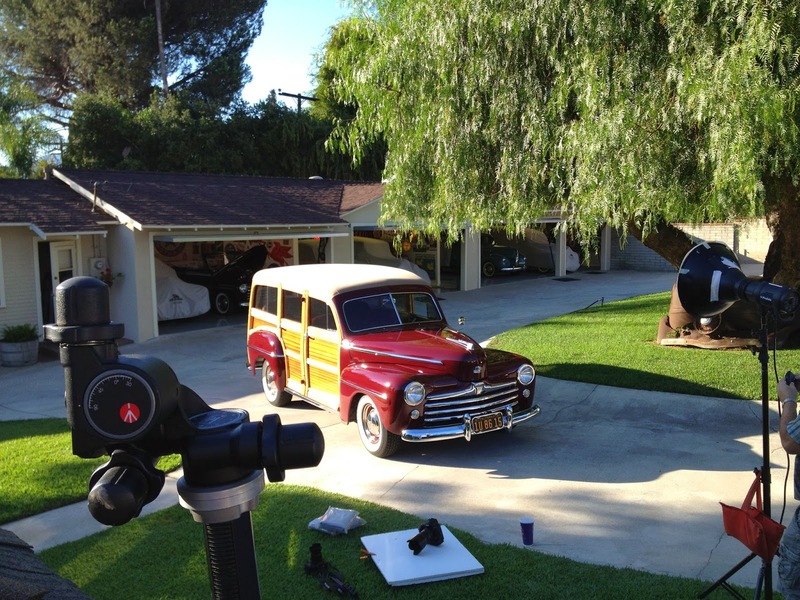 The December California Car Cover catalog cover photo shoot brought us to the home of local customers, Bob and Sandi Valenzuela. 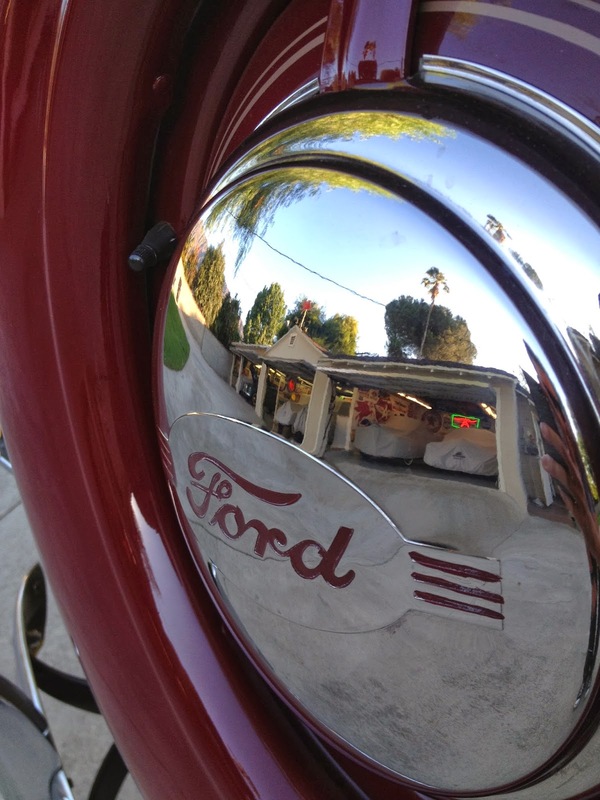 The couple has a great collection of classic 1930s-40s Ford vehicles and we were thrilled that they would participate in this year's Santa's Workshop photo shoot. Bob and Sandi's multi-car garage has expanded through the years to accommodate more vehicles and more collectibles. 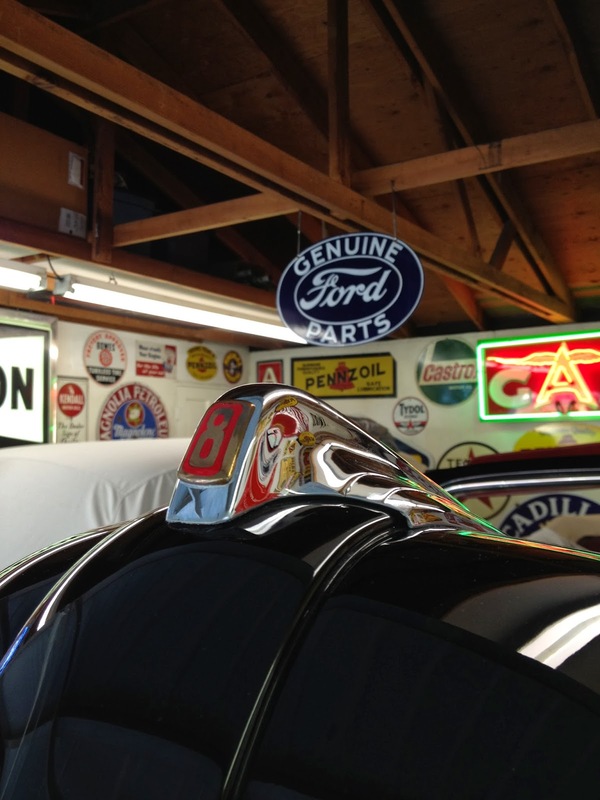 We are pretty fond of all those Plushweave California Car Covers, but check out their amazing collection of vintage signs and neon. 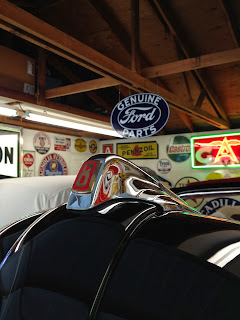 Vintage signs & grey car covers. 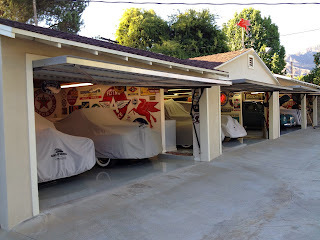 How we think every garage should look. The old Ford sedan that surrounds the tree has been there quite a while. 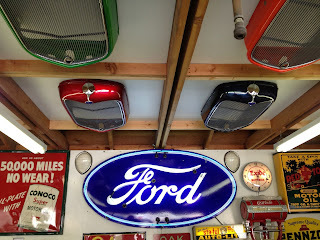 Bob has amassed quite a collection of 1932 Ford grilles. He proudly displays them in a variety of colors throughout the garage. 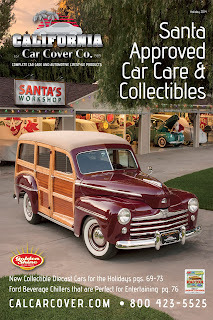 The featured vehicle on our December catalog cover is a 1948 Ford Deluxe Woodie. 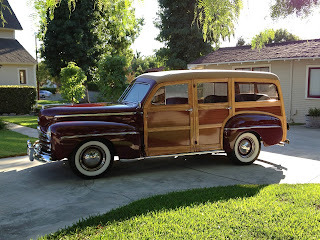 The Woodie features maroon paint. It has a small block engine under the hood and maroon leather interior to match the exterior paint. Even more vintage steel signs along the fence. Here is the catalog cover in case you haven't received your copy in the mail yet. If you would like to receive our monthly catalog in the mail, you can sign up on our website. Thanks again to the Valenzuelas' for letting us photograph our December catalog cover at their home. We had a great time and definitely appreciated the hospitality. 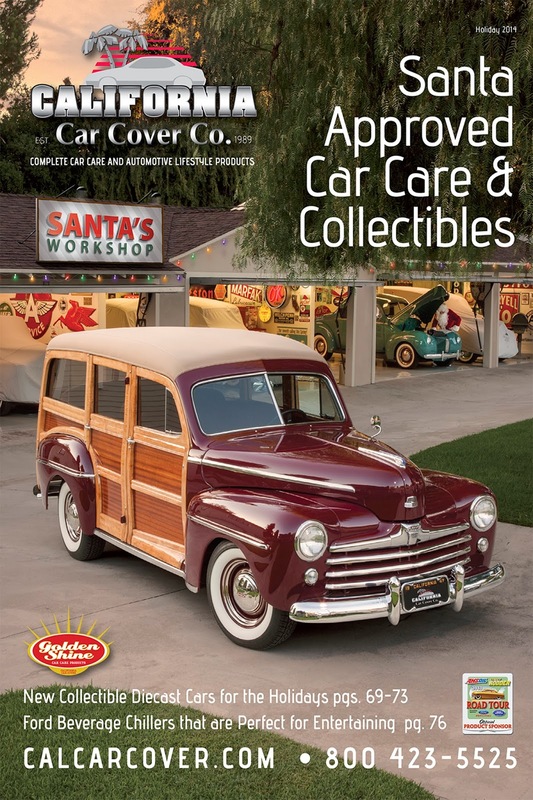 Here is a video of the three great vehicles that were featured on our California Car Cover catalog covers this holiday season. Check back next week for coverage from the Motor4Toys charity car show, plus the Mooneyes X-Mas Party and final Pomona Swap Meet of the year. This past weekend was the annual Mecum Auto Auction in Anaheim, Ca at the Convention Center. 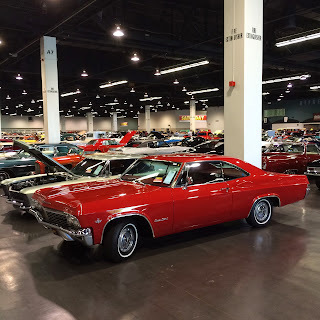 The auction featured a number of great classic cars, muscle cars and hot rods all up for sale. 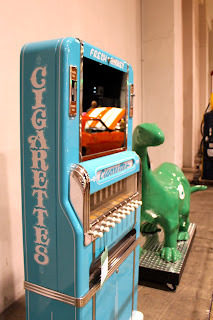 There was also a great collection of nostalgia and collectibles up for auction as well. Here are some of my photos from Saturday morning. The halls of the convention center were packed with 100's of classic cars like this Chevy Impala. 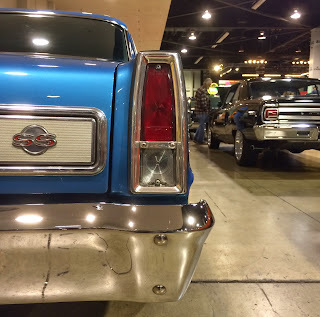 Since you have the chance to walk up and look inside all of the vehicles, it really is like going to a car show. 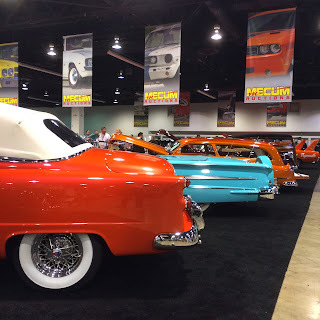 Mecum auction coverage is broadcast on the VelocityNetwork, but here are some photos of everything you might have missed. The red carpet at the Mecum auction is were all of the featured vehicles from Saturday afternoon were displayed. There were plenty of hot rods like the Hi-Boy above and the 1957 Chevy below. Very cool 1950s MTC E10 Electric Train with track. 1949 Ford Woodie Wagon with a flathead V-8. 1966 Ford Ranger Fleetside in White and Sahara Beige paint. 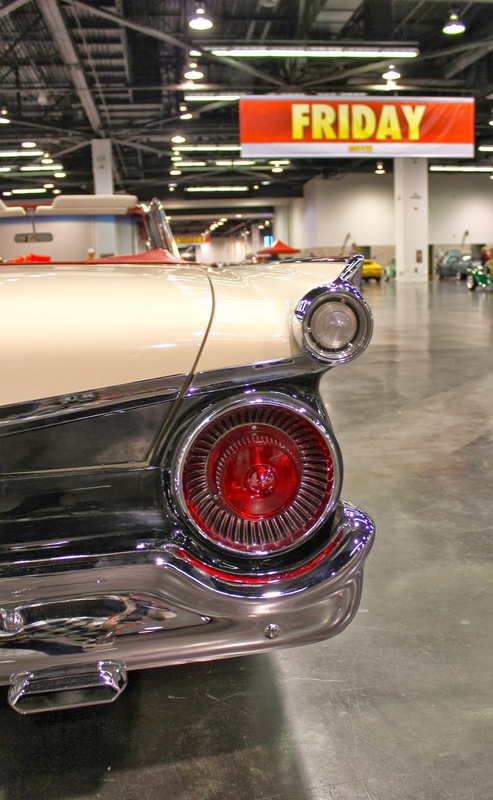 Whether you were looking for an original classic car, a restored truck or custom hot rod, there was something to check out at the Mecum Auction. There were plenty of great Ford pickups up for sale on Saturday, like this blue & white one. What classic car has these unique rear vents? It is a 1953 Packard Clipper Sportster. A unique Jaguar XJS with some exterior modifications. A killer custom 1940 Cadillac Series 62 with stretched rear fenders. 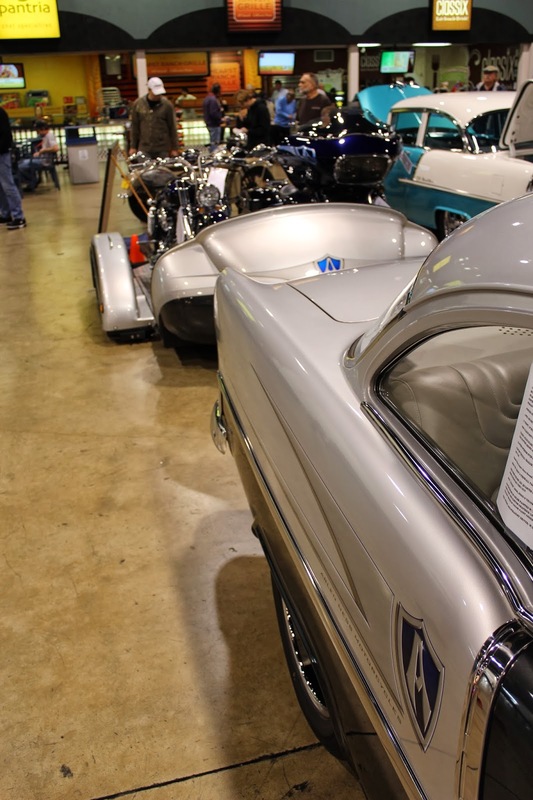 Up for sale on Saturday was a custom 1955 Chevy built by Arlen Ness along with a pair of custom Ness motorcycles. 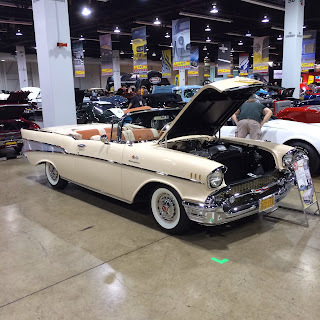 There were a few great looking Chevy Cameo pickups at the auction, including this beige 1955 model. 1969 Chevy COPO Camaro with a 427 engine. The auction kicked off Saturday morning with a number of nostalgia and collectible items. 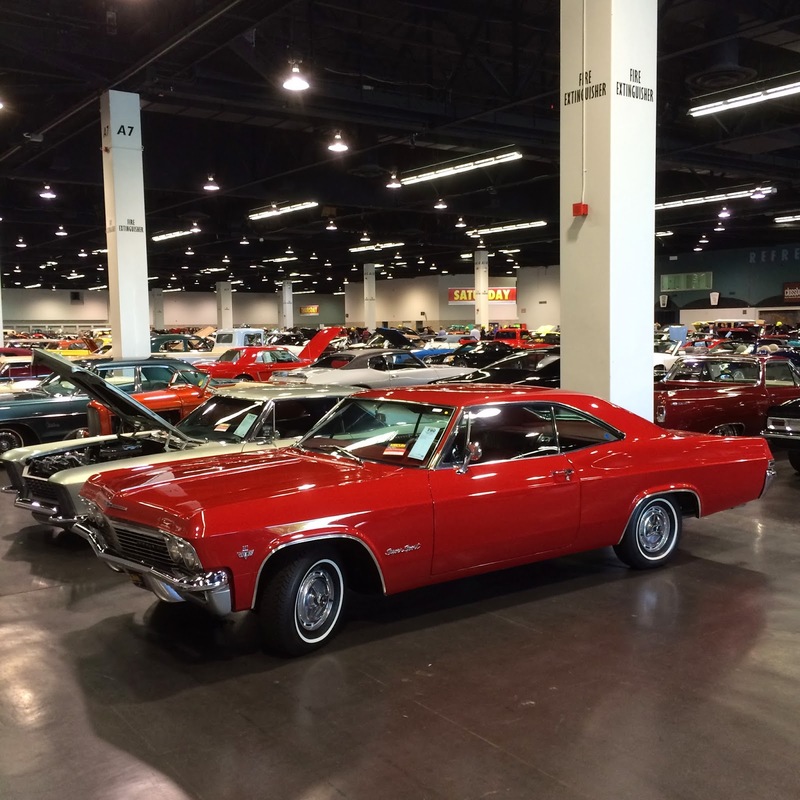 The lineup of cars waiting to cross the auction block on Saturday morning. 1957 Olds Golden Rocket 98 Holiday Coupe with a Buick in the background. Just one of the many clean Chevy C-10 pickup up for auction over the weekend. 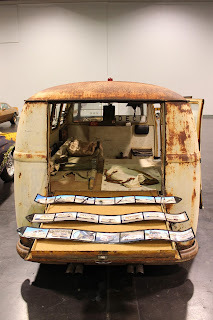 This was an interesting find for any vintage VW collectors. 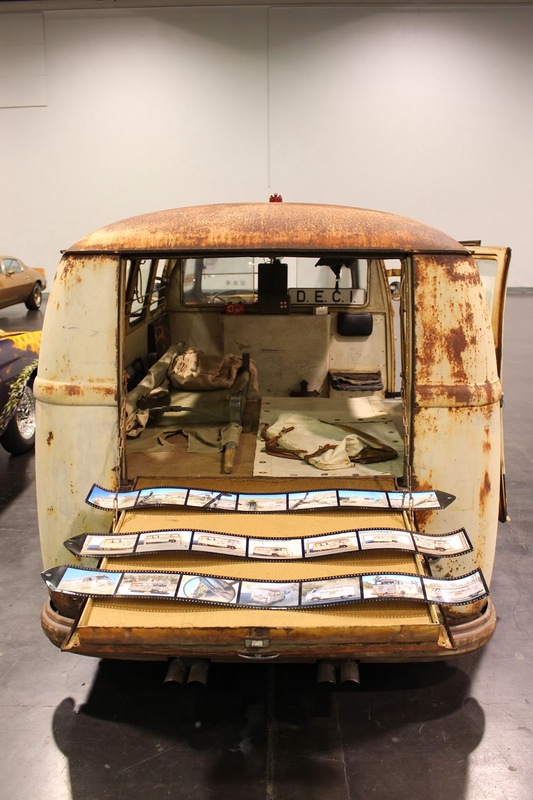 It is an original VW ambulance. 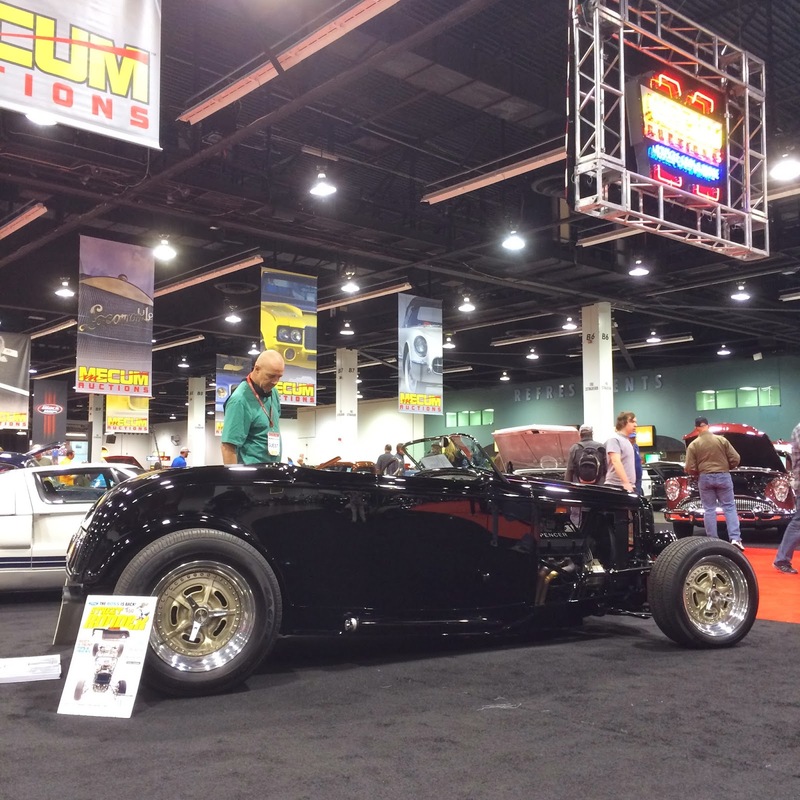 You can get the auction results from the Mecum website later this week. Check back next week for more photos from local automotive events. We are one of the sponsors of the Motor4Toys Charity Car Show and the California Car Cover Crew members will be at that event this coming Sunday. Movember is Back at California Car Cover!